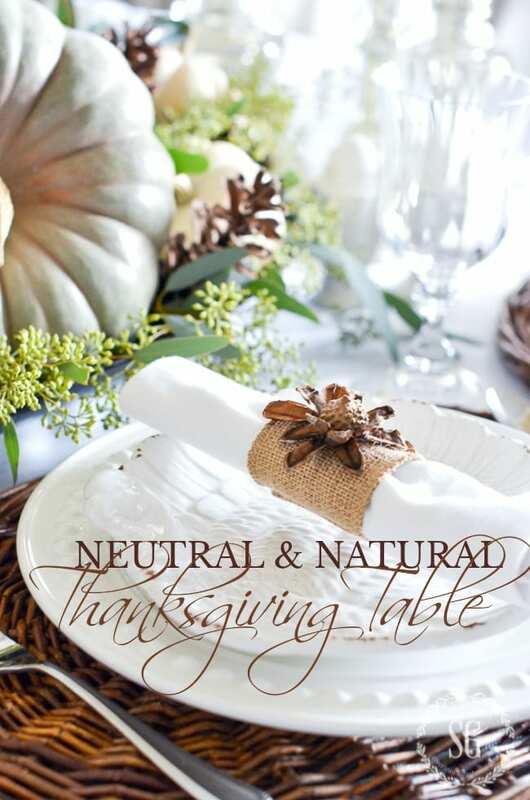 It’s time to be thinking about setting our Thanksgiving tables. 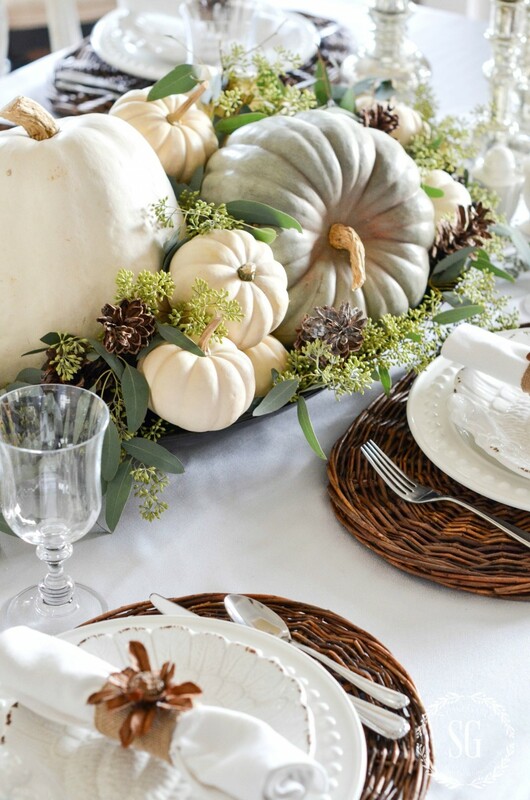 Even if you are not hosting it’s fun to set a pretty table now and enjoy it until turkey day! 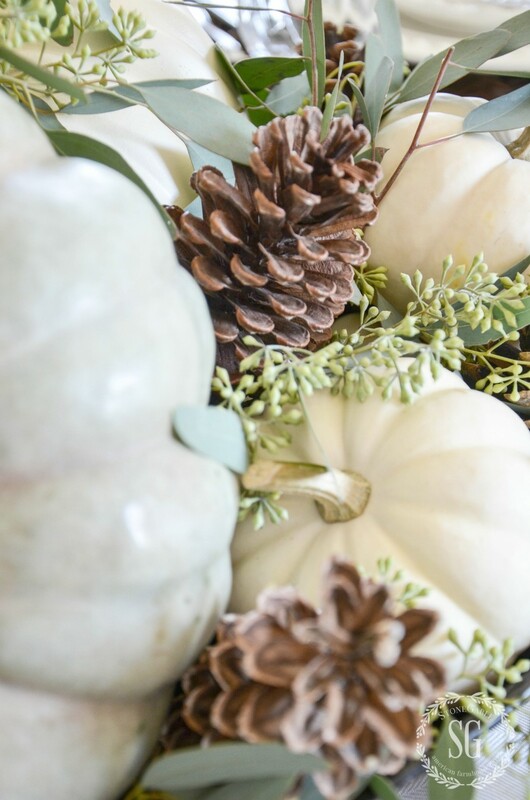 This year I was inspired by natural elements like blue and white pumpkins, seeded eucalyptus, pinecones, and acorns. These all work together to make a magical and soft table when mixed with white dishes! No fuss here, just beautiful organics and great and simple dinnerware! 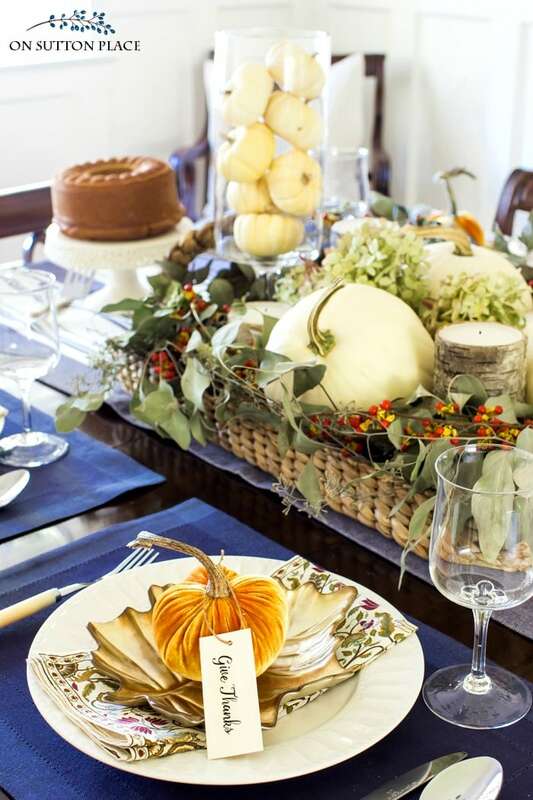 The inspiration for this table came from the blue pumpkin and natural napkin rings. 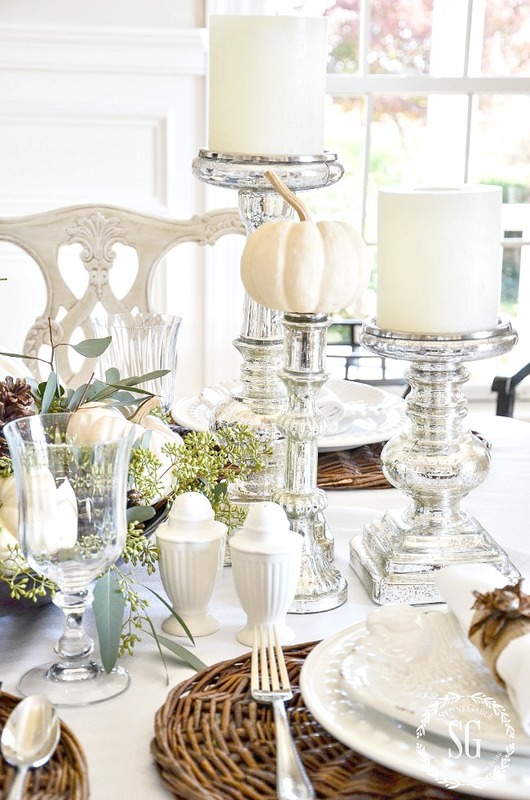 Everything took on a natural feel with a little sparkle from the Mercury glass candlesticks! 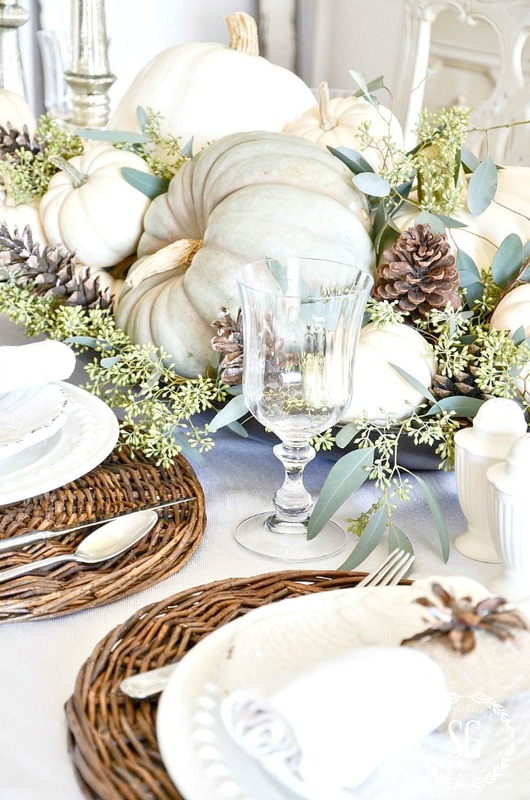 In the center of the table, an oval bronze tray spills over with pumpkins, pinecones, and seeded eucalyptus. I’ve gotten a whole lot of use out of my blue pumpkin and baby boos! Because I wanted a very light, bright and soft look I used a white tablecloth as a base layer. And to bring more organic texture to the table I used woven placemats. I’m wild over high contrasts and high/low style! The napkin rings were made from empty toilet paper rolls that were covered with burlap. 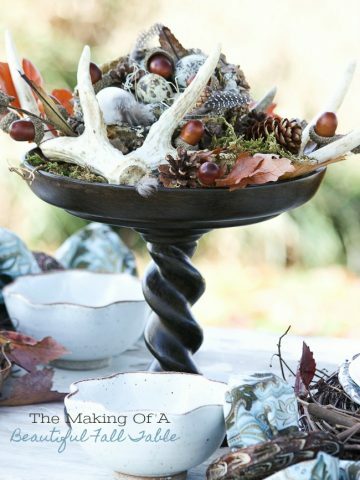 The stylized flower on top of each was made from pinecone arms and acorn tops! 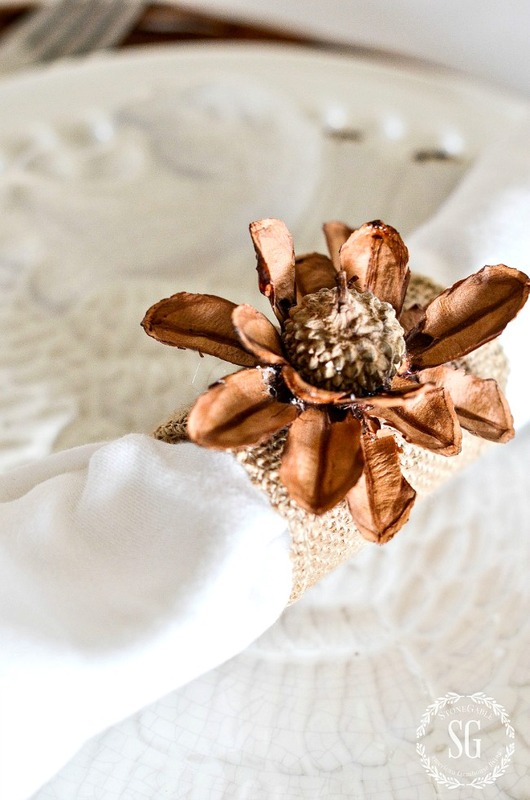 You can see a very easy DIY for PINECONE AND ACORN NAPKIN RINGS HERE! Although the table is made up of lots of organic materials, I wanted the table to have a little bling too! 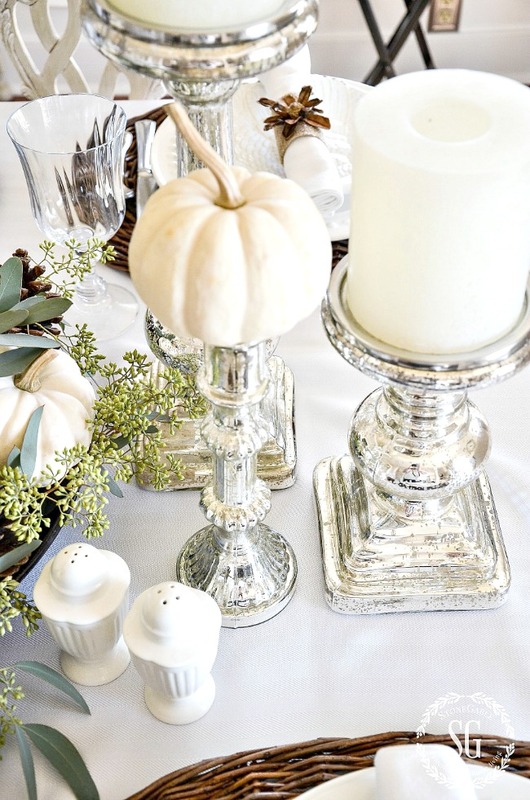 Mercury glass candlesticks hold creamy white candles and baby boo pumpkins! The table’s set and ready for guests! HAPPY THANKSGIVING! You can follow me on Pinterest and see what I’m finding to pin every day HERE! 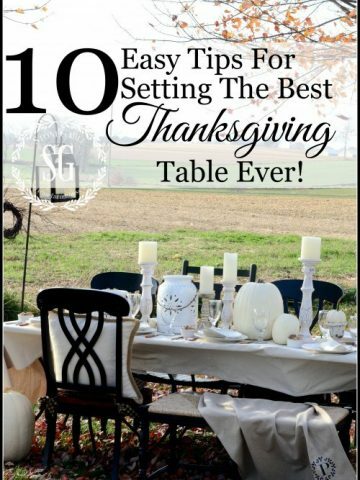 10 EASY TIPS FOR SETTING THE BEST THANKSGIVING TABLE EVER! 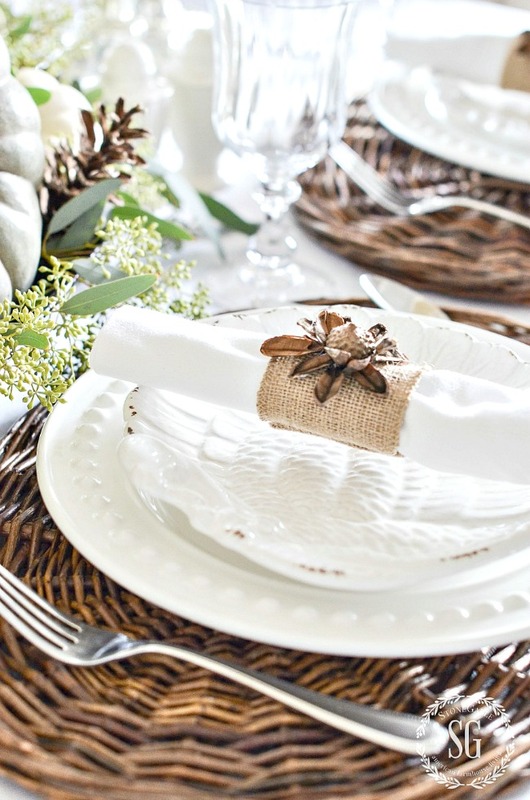 I always love your tablescapes, especially the natural elements. Where do you buy your greenery? I can walk in the woods for some things, but I am in a rural area without the great chain grocers. Do you have a source online? I am an hour from Greensboro, I would make the trek to a sure source. Thanks again for your inspiration, especially on Sunday! These are beautiful, Yvonne! I have been following you for over a year, and incorporated a lot of your ideas in my home, including white pumpkins, burlap, and pine cones. 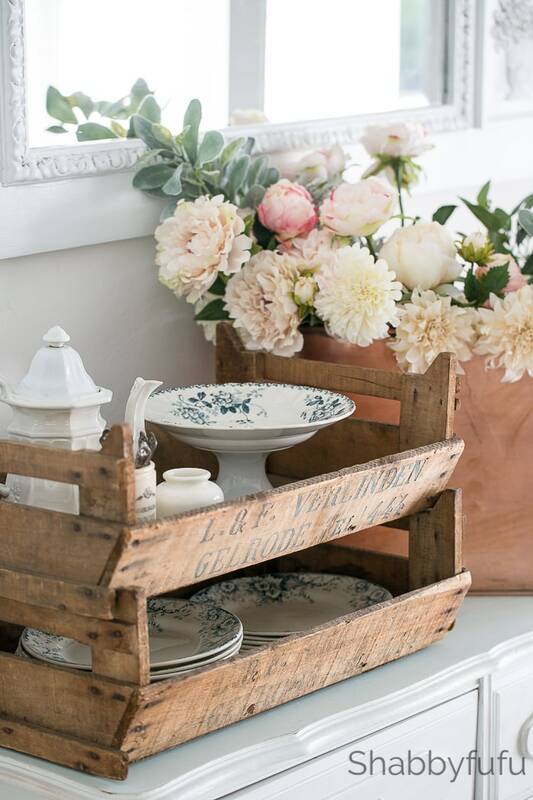 I just love your fresh, natural look in decorating! Love the table setting! 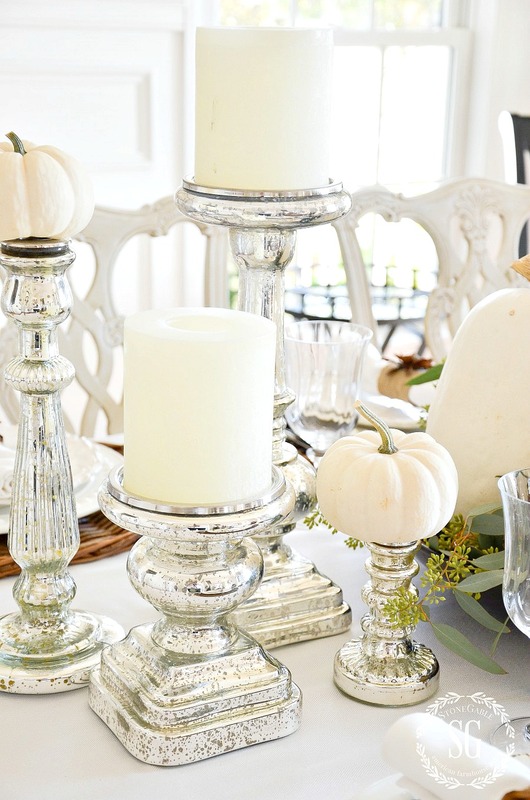 Can you share where to get the mercury glass candle sticks? OOH..I do love this display. Your right so neutral and natural. 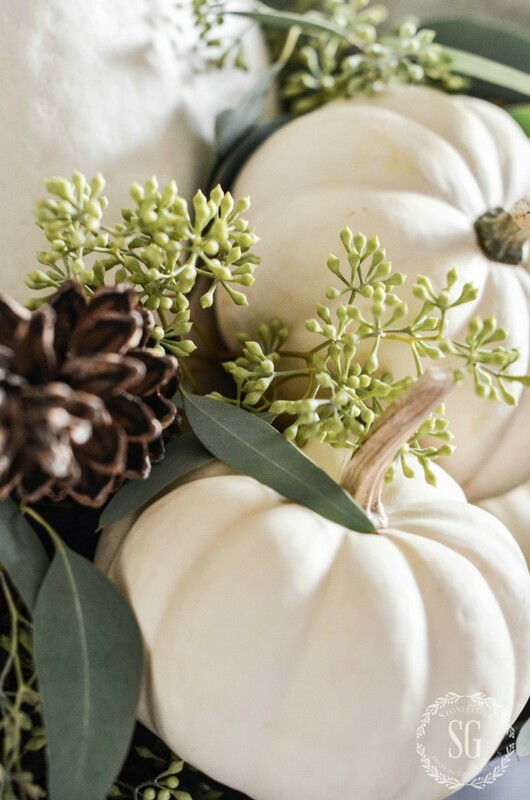 Love the white and blue pumpkins. Thanks Yvonne. SO pretty, Yvonne! Thank you for sharing… you are always inspiring! Loving the all the naturals since I’m on a natural kick.I am setting the table for Thanksgiving but I don’t think it will as pretty as yours. You are so talented! 1st time on your blog and regret i didnt find you sooner! Beautiful ideas and sounds that you have a beautiful soul! Welcome to the StoneGable family Deb! So glad you found us! Oh, so sorry but this just doesn’t say thanksgiving to me. While very pretty and elegant it’s just too bland for me. I love the rich jewel colors of fall. Give me plaids and warm earth colors any day. I must say that you inspire me daily! More ideas to add to my DT&T journal. 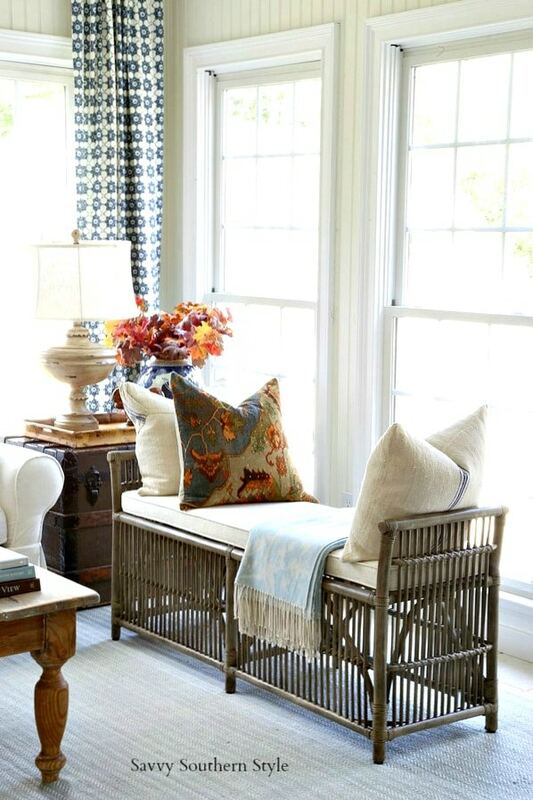 Where do I find wicker place mats similar to yours? P.S. The DD&T episode on thanksgiving table decorating was so enjoyable to listen to. The 3 of you were magical together. It was like you were all in a room, glass of wine in hand and having a great girls day! Another gorgeous natural table. 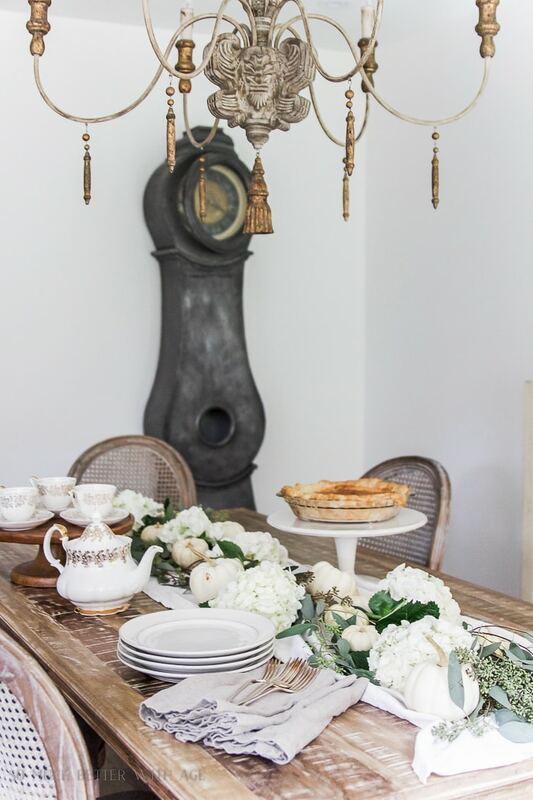 Though I love your closeup photography of the different elements of your table ….I often long for a picture of the ENTIRE table to capture the whole feel of the table. Just thought I would mentions that. Have a wonderful Thanksgiving. 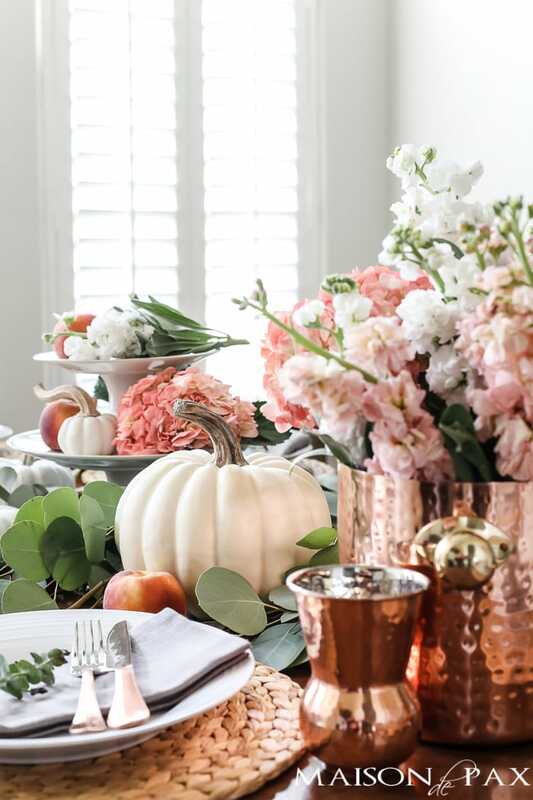 Your Thanksgiving table is just beautiful! So elegant! I want to make some of those natural napkin rings. They look great on your table setting. 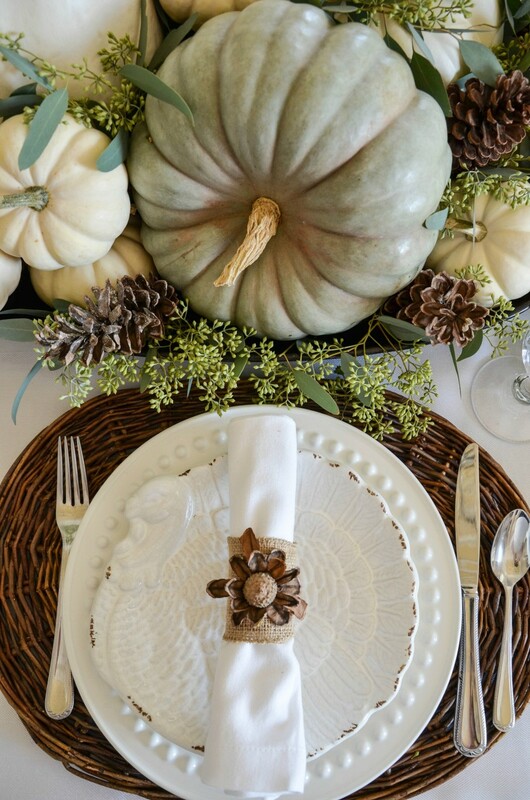 Your Thanksgiving tablescape is beautiful. Hi Laura, I started off with a 2 inch jute ribbon (see it here:http://amzn.to/2zWEaV9) and cut it down. Hope this helps. First, welcome to the StoneGable family. Yes, I usually list my sources with a link for them if I have them. I think I bought these chargers on Hayneedle or Amazon but looked and looked and could not find them, even on my history. I rarely take the time to post a comment (don’t know why since I have a chance to win something every month- so lovely!!) however, today I had to comment and say thank you for all you do on this blog!! It’s beautiful and so well done. I have been enjoying your recipes and my family has as well.? And I can’t say enough about the podcast….SO many wonderful ideas and so much fun listening to you, Anita, and Kelly. It’s like having coffee with friends and walking away inspired. I look forward to you daily post…so many beautiful ideas. Sundays post are always my favorite- a cup of coffee in hand and your lovely post every Sunday after lunch. 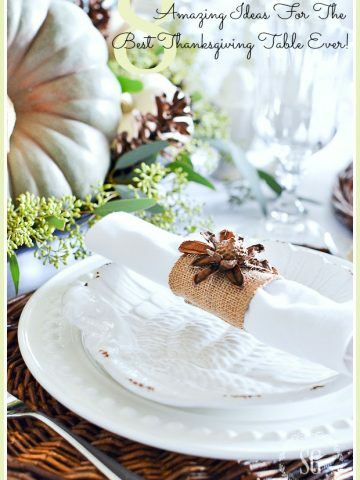 The Thanksgiving ideas have me feeling “guest ready” since I’ve already gotten started this year- a first for me.? The Thanksgiving continental breakfast idea- genius!!!! My family will be thrilled since I’m usually busy cooking and point to the cabinet that has the cereal. Ha!!!!! So again….thank you for sharing your beautiful ideas through this blog- your readers are blessed by your creativeness and your genuine caring personality shines through. I love the natural centerpiece on your dining room table. I especially like the use of seeded eucalyptus. I use to work at a floral shop and used seeded eucalyptus and hypericum berries with the many hues of fall mums. Your post are very inspiring. Have a great day! Thanks Yvonne! 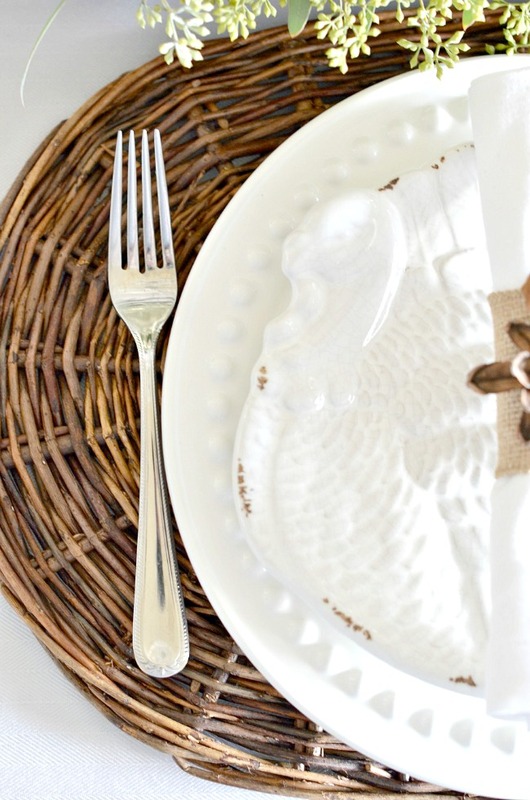 Beautiful table setting for Thanksgiving. I scored new white bone china dishes at Home Goods yesterday. Looking forward to implementing them into a beautiful table! By the way, are your pumpkins real? Blessings! Yes, I would like to know about the pumpkins as well. Love this table! I would be interested to know about the pumpkins as well. Love this table! 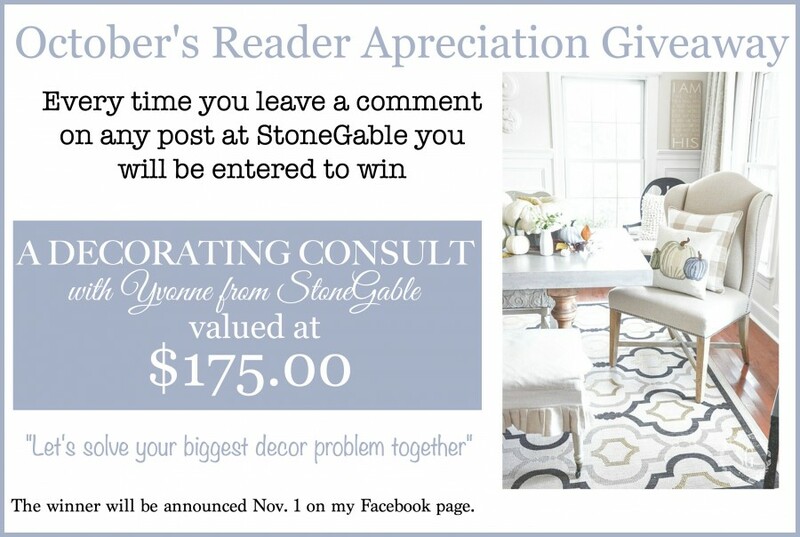 Thanks for another great post, Yvonne! 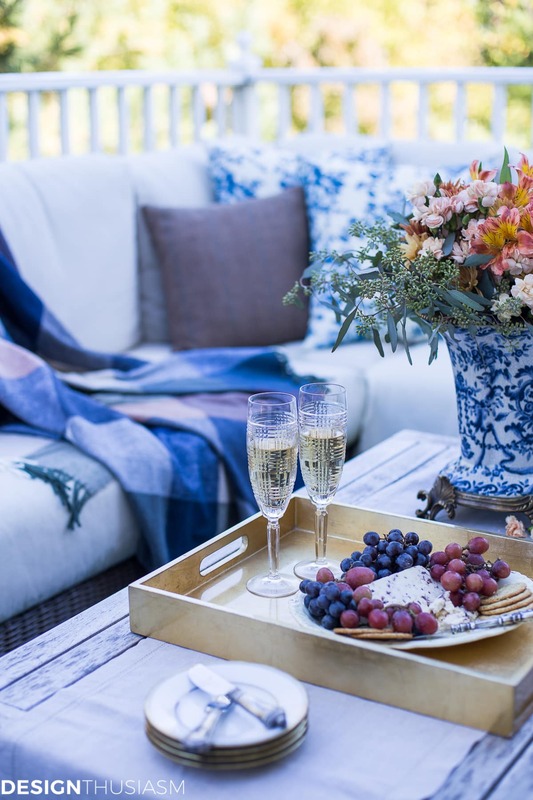 Your natural tablescape is lovely! What a lovely table setting, Yvonne. Yes! The natural elements make it look very inviting for company. I will use one of my favorite phrases to describe it…understated elegance. 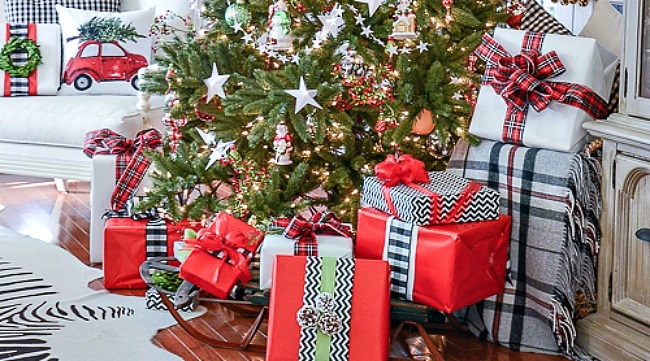 You cannot go wrong in home décor, fashion, parties, etc., with the look of understated elegance! I am a little behind on your blog! I was actually vacationing in Pennsylvania last weekend and went to the Penn State football game in State College, then I visited Gettysburg! 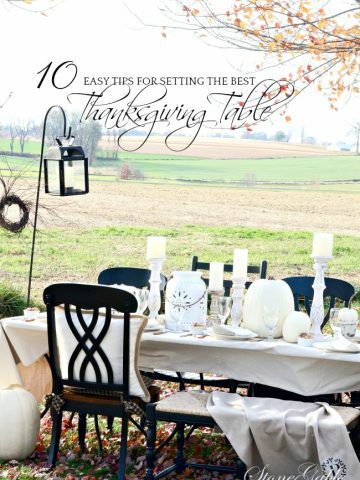 I am starting a list to get ready for Thanksgiving, and I was very inspired by your table setting. It’s just beautiful! It’s time to wash the crystal and begin planning my tablescape and menu! What a beautiful Thanksgiving table! I love how you use neutrals in your your decor. I never thought to do that but you have shown me how exquisite it could be! Many thanks!